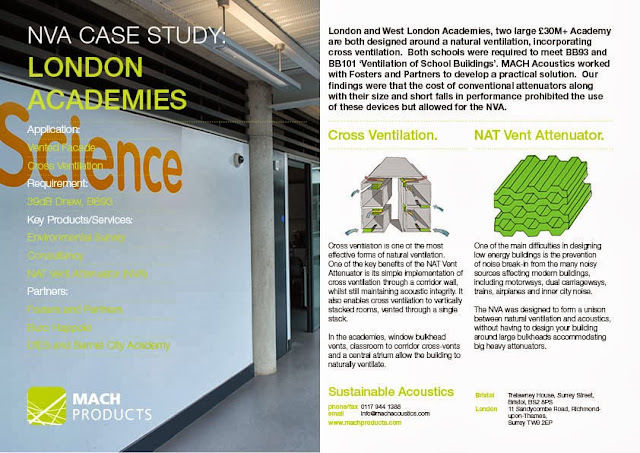 London and West London Academies, two large £30M+ Academy are both designed around a natural ventilation, incorporating cross ventilation. Both schools were required to meet BB93 and BB101 ‘Ventilation of School Buildings’. MACH Acoustics worked with Fosters and Partners to develop a practical solution. Our findings were that the cost of conventional attenuators along with their size and short falls in performance prohibited the use of these devices but allowed for the NVA. The academies featured many different imaginative implementations of the NVA as a cross ventilator, all venting into a central atrium. Air passed though the facade via actuated windows through bulkheads at ceiling height containing the NVA. The main principle was to add an attenuator with 25% free area and a face area of 1.5m2, with small splitter sizes. The attenuator was to be located above a cupboard spaces as shown below. A flap enable the vent to be opened and closed. One of the main advantages of the NVA is the ease and simplicity of installation. Once the bulkhead has been constructed, the tessellating foam is arranged into honeycomb pairs by alternating orientation, then simply slid into the duct. Since the foam is malleable and can be cut, fitting around building services or any on-site alternations can be easily achieved. Installation generally takes under one hour - saving money and construction time. With the window facade bulkhead, we were able to implement cost savings by negating the need for expensive weather louvres, using actuated windows instead. Not only was the cost significantly reduced but the installation was greatly simplified - both points highly valued by the contractor.